In my earlier years, I remember taking road trips with my family throughout Western Canada that could have provided inspiration for a future instalment of the Griswold's National Lampoon adventures. These vacations often signalled the end of the school year; a time I anticipated with great zeal as I was every ounce the trope of awkward, artsy young adult not relating in the slightest to my peers. I knew back then that heading across the plains through the snowy peaks of the Rockies would ultimately provide more transcendence to the narrative of my life than the typical rituals of adolescence. Except for the influence that Saskatchewan would provide. I never would have predicted how much inspiration this underrated land would provide me in my recent years. Saskatchewan was, back then, the most dreaded part of my journey. It representated a land of nothingness. Manitoba had trees. Alberta had mountains. Saskatchewan had...fields. 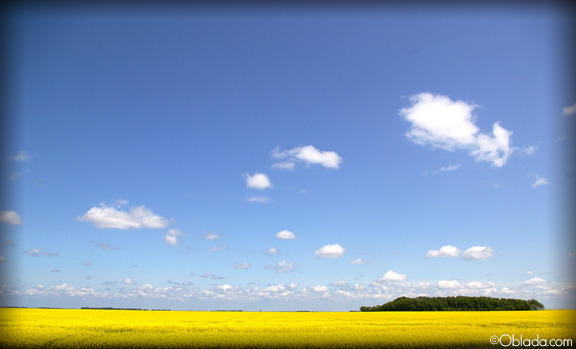 Endless vistas of sky and canola or wheat or whatever was in season. Thinking about it now, this is actually why I love it. But for someone used to constant visual stimulation, it was a barren wasteland of small towns stuck in the depression era waiting for a sandstorm to erase them from memory. "What do these people do? ", I would often ask myself. "What kind of life is this?" I hope to impart my knowledge to the people who responded to this. Saskatchewan residents are hard-working individuals that remain down-to-earth despite newfound wealth and prominence on the national economic front. It's not so much about keeping up with the Joneses, as it is enjoying life on your own terms, remaining humble and proud, and keeping green de rigueur every fashion season. This translates to taking time to appreciate one's surroundings and look beyond gloss and polish to witness the true beauty within epic skies and endless fields of canola. Or wheat. I'm glad I took the time to discover it. Pace yourself. Saskatchewan is worth stopping in. It's worth getting to know. What a change from last year! The Saskatchewan Roughriders are on a roll with a thus far UNDEFEATED football season. Celebrate their success and show your Rider Nation pride by checking out the Melonhead app created by the SIAST Marketing and Communications team. Click here . I first noticed the fire truck on Broadway Bridge when I crossed it on Friday. Changing lanes to avoid the potential aftermath of a vehicular collision, I then noticed the three distraught teenage girls staring in shock at the rocks below. Most people don't think of Saskatoon's bridges beyond traffic but, while beautiful, there is an aura of sadness that surrounds them. Living and working downtown, I've come to recognize and appreciate the characters that perform on the stage that is #YXE. There's the woman with the epic beehive who has a fondness for leopard-print fashion. The buskers that provide the soundtrack for 1st and 21st. And also, sadly, the senior citizens that walk amongst the shadows, unnoticed by white-collar hustlers who's sole focus is personably quantifiable ROI. These are people who also helped build the province and are now faced with the hard realities that an economic upturn brings. Individuals who now resort to digging through trash bins for bottles or discarded day-olds. They've stopped caring about people staring because they know they are invisible. Forgotten. Avoided. Boom. And follow @StreetsofYXE on Twitter. And follow "streetsofYXE" on Twitter.